meredithsskinspa has no other items for sale. Olay Total Effects Night Firming Facial Moisturizer Treatment - 1.7 Fl. oz. 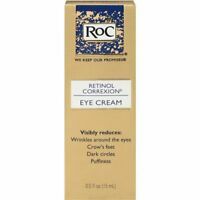 Roc Retinol Correxion Eye Cream 0.5 oz. While you’re still young at heart, your skin may show otherwise. Restore your eyes’ youthfulness with Olay Professional Pro-X Eye Restoration Complex. ProX Eye Restoration Complex is professionally designed for the part of your face that communicates age the most—the delicate area around your eyes. Reduce your eyes’ crow’s feet appearance while also giving the area around your eyes a smoother, taut appearance. Lessen the darkness of under-eye circles, and reduce the excess fluid around the eyes to alleviate puffiness with Olay Professional Pro-X Eye Restoration Complex. Using this product twice a day helps to reduce the signs of aging and promote better health for the delicate skin in the eye area. Olay Professional Pro-X Eye Restoration Complex is specially formulated to improve the quality of the skin around your eyes. 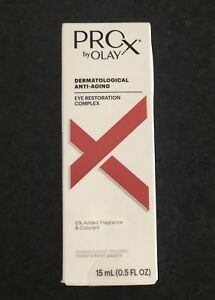 While Pro-X is a topical cream treatment, the product is specifically designed to tackle the root causes of visible skin aging, as a part of Olay’s anti-aging regimen. Eye Restoration Complex is formulated with a fusion of caffeine, amino peptides, niacinamide, and glycerin. Ingredients like caffeine instantly wake up the skin around your eyes, and additional ingredients, like glycerin, help ensure that hydration lasts throughout the day. The formula intensely hydrates and boosts surface cell turnover to help reduce the signs of aging skin, including fine lines and wrinkles as well as dark circles and puffiness. Olay Professional is at the forefront of science and anti-aging technology. Leading dermatologists and Olay skin scientists have partnered to form the Olay Professional Panel for Skin Care Innovation. The team has professionally designed and tested these products by selecting anti-aging ingredients to treat your specific skin care concern. Pro-X scientists leveraged advanced skin research, including genomics, to get to the root causes of skin aging: stratum corneum dehydration, reduced skin surface turnover, photo damage, and a compromised skin surface barrier. Olay Professional Pro-X Eye Restoration Complex was created through this partnership to protect, treat, and transform your skin’s appearance. The cream contains a combination of anti-aging ingredients that are designed to work together for excellent results in treating primary and specific aging skin appearance concerns. 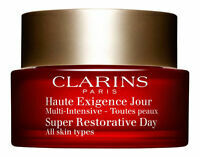 If used daily as a part of your skin care regime, your potential for skin improvement can be maximized. Simply use Pro-X in the morning and at night by applying the Eye Restoration Complex cream to the corners, lids, and lower eye area. Gently massage the product into your skin until it is absorbed. Be careful not to get the product in your eyes. The hope of ageless skin is eternal among today's women and the Oil of Olay ProX products help make that hope more of a reality. I am 58 with more than my fair share of sun damage and the faded remenants of teen-age acne. It's amazing that I have, at my age, finally achieved almost perfect skin texture and an even skin tone. The ProX eye cream and other skin firming products have made a definite contribution to this small miracle. These products are keepers! Not inexpensive, but less than many others from more prestigious name brands. I believe they do the job intended. Try them - use them at least three months. I think you'll be happy with the results! 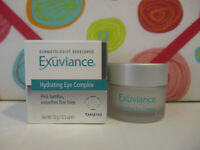 The Eye Restoration Complex is my favorite in the ProX line. Just a small dab to the eye area is adequate. It is non-greasy. It makes crows feet look softer and less harsh. I know of nothing that compares to it. I gave a container of it to my thirty-six year old daughter who doesn't have eye wrinkles. I told her to start using it now, and in ten years she would be glad she did. This product actually does what it is advertised to do! At age 67, I have tried many products claiming to be wonderful, only to discover that they were not. This product actually does what it claims to do. The First Time I used it, the dark circles and puffiness under my eyes appeared to be less noticeable, and I stood looking in the mirror in awe. The product is unscented and does not burn when applied, as do many other quality skin-care products when used by those of us with sensitive skin. It goes on very smoothly and very little is required. 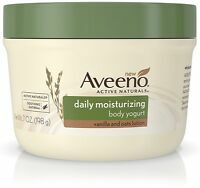 This product is light and just the right amount of moisture. I use this product in the morning & evening before bed. I noticed improvement in my eye area within a couple of days. Other product brands that I have used were too heavy and/or just did not perform. I am definitely pleased with my purchase! Read a good review of this product and have been using it ever since. I would like to use it longer to see how it stands up over time. So far, it doesn't burn my eyes. It is thick enough to adequately moisturize the eye area without seeming greasy or cakey. I have trouble with dark circles and it seems to minimize this problem. I just turned 40 so a good eye cream is very important to me.